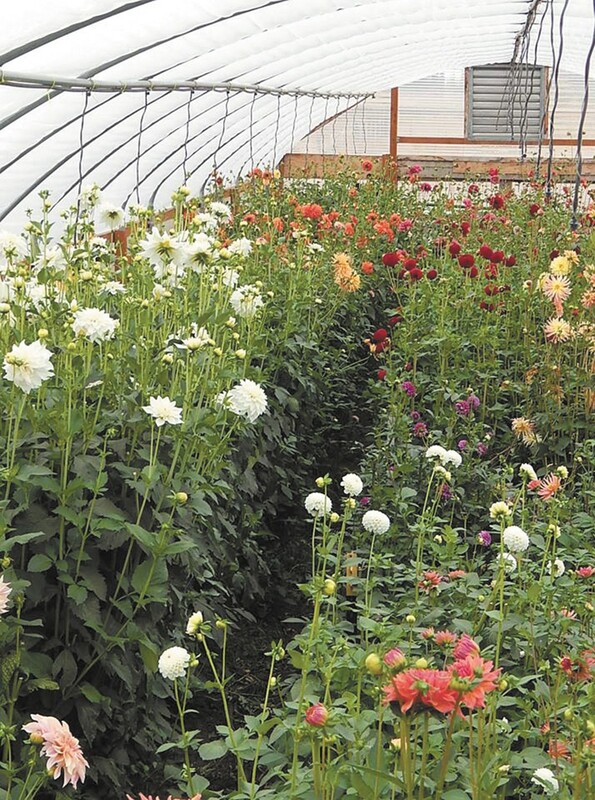 Dahlias bloom in a greenhouse at Tall Grass Farms. Getting flowers makes us happy, according to a 2005 research study that confirms what most people would say is common sense. Or is that common scents? Those smiles, however, may turn to frowns when considering hidden dangers in some commercially grown flowers. The United States Department of Agriculture reports that U.S. floriculture is the country's top user of pesticides per acre. And that's just part of the problem. About 70 percent of flowers sold in the U.S. are grown elsewhere, mostly in Colombia and Ecuador, countries with different environmental standards. Numerous reports document significant health risks to floral workers, particularly outside the U.S., which may translate to consumer exposure to pesticides and preservatives on shipped flowers. In fact, tests of pesticide levels on imported roses have revealed residue levels 50 times higher than what is allowed on food. The good news is that the industry has taken notice, especially since the publication of Amy Stewart's 2007 book, Flower Confidential: The Good, the Bad, and the Beautiful in the Business of Flowers. There are now organic retailers such as Organic Bouquet and California Organic Flowers. Veriflora offers "sustainability and eco-labeling" to growers of cut flowers and potted plants, as well as designating preferred providers. Many Shopko locations are Veriflora-certified for their bedding plants, for example. Some Trader Joe's locations offer Veriflora-certified flowers, according to spokesperson Alison Mochizuki. Though the case for preferring organic flowers is nearly as compelling as it is for food, few certified local growers exist — though Killarney Farms in Rose Lake, Idaho, is one. A big challenge which any Northwest gardener can attest to is the short growing season, while another is the arduous process for becoming organically certified. However, there are a number of people — growers, floral designers, retailers — who are nonetheless promoting a healthier flower industry. "We have come to expect that some things can be grown cheaper in other countries," says Nicki Farrell of Tall Grass Farms in Medical Lake, "so we try to focus on flowers that do not ship well." Specializing in dahlias, Tall Grass sells to Spokane's Rose & Blossom (formerly Just Roses), Special Touch Floral Studio, Erica's Expressions, Main Market Co-op and a few area farmers markets. Last year, says Farrell, they grew everything organically, using only neem oil, supplemented by a regular shipment of ladybugs. "We have decided that a few bugs are not the end of the world," says Stacey Van Wingerden , who operates Vanhoff's Garden Center in Coeur d'Alene and Van Wingerden Greenhouses in Priest River, Idaho. She cites growing concern over how a class of insecticides known as neonicotinoids are affecting pollinators. "There's a huge shift because of the bee population," she says, noting that she requires her vendors to commit to using natural ingredients, and is moving away from selling synthetic pesticides in her store. Christen Davis Venn of Dragonflower Design works out of Vanhoff's and uses flowers from Spokane's Skyline Flowers and Bonners Ferry's BeeHaven Flower Farm. She says that she's noticed more people ordering local, seasonal products, and happily incorporates flowers provided by the customer into her designs.